Surprisingly low in fat, this dish has a deliciously fresh, tangy sauce. Serve with new potatoes and broccoli. Place the new potatoes in a pan and cover with cold water. Bring to the boil, then reduce the heat and simmer for 15 minutes or until tender. Meanwhile, using a sharp knife, slice into each chicken breast horizontally to make a pocket. Cut one of the lemons into 8 slices, and place 2 lemon slices into each chicken breast pocket. Press the crushed green peppercorns onto the chicken breasts. In a nonstick frying pan with a lid, heat the oil then add the chicken. Pan fry for 4-5 minutes on each side until golden brown. Remove from the pan, place on a warmed plate and cover with foil. Grate the zest from the remaining lemon and squeeze the juice. Add this to the pan, using a wooden spoon to scrape up all the juices. Stir in the honey, crème fraîche and tarragon, and bring to the boil. Return the chicken to the pan and spoon over the sauce. Cover with the lid and simmer for 5 minutes, until the chicken is thoroughly cooked, and the juices run clear. 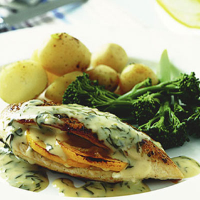 Serve the chicken fillets with the new potatoes and tenderstem broccoli, which can be steamed over the potatoes for the last 5 minutes of their cooking time. Unwaxed lemons are good for using in recipes where the zest is required. Instead of potatoes, you could serve the chicken with pasta mixed with broccoli.